The Y-DNA Project of the Ewing Family Association welcomes your questions and comments: dna@ewingfamilyassociation.org. 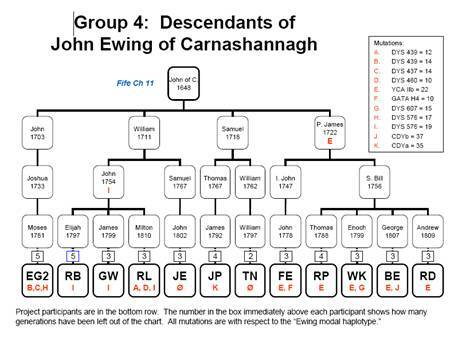 Results of the Ewing Surname Y-DNA Project are displayed in several inter-related forms, any of which can be reached from the links on each results page. When you click on one of these links, your browser will open a new window with the page you requested. Network Diagrams are an easy way to get a quick overview of project results. They display genetic distances between participants graphically, so that clusters of more closely related individuals are easy to see. 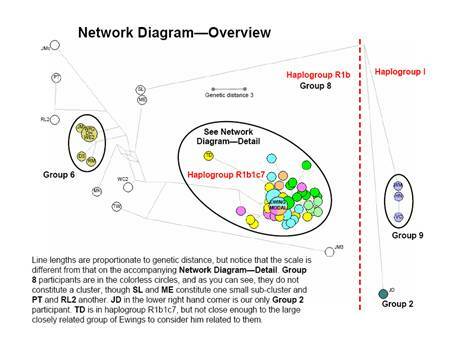 Distances between individuals in a Network Diagram are proportional to the genetic distance between them. Our Network Diagrams were prepared using Network, a shareware program from Fluxus Engineering, which is available for free download from their web site. For more information about Network Diagrams, use the About Network Diagrams link in the Results Directory. 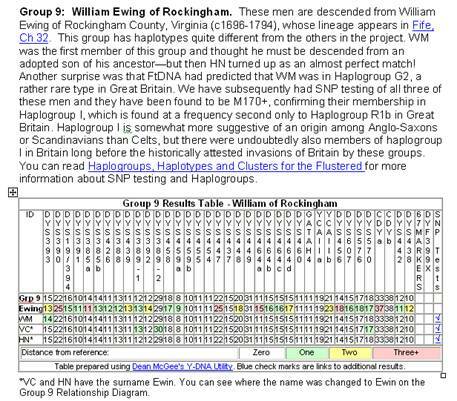 For every group, there is a Results Table that shows the haplotypes of the group's members. Discussion of the results shown in each table appears in a separate document that can be reached via the links under the heading Results Tables ... Heading in the Results Directory. In each Table, the first row after the marker names is the “reference row” and is a modal haplotype with which individual haplotypes (and sometimes other modals of interest) in the subsequent rows are compared. Differences from the reference row in participants’ haplotypes are highlighted in colors based on the distances from the reference row. Not all of the Groups are compared to the same modal haplotype. Go to Modal Haplotypes for a brief discussion and comparison of these and other modal haplotypes of interest. Because of space limitations, these tables display only 37-marker haplotypes. Many participants have had additional STR marker and/or SNP testing. The IDs of those who have had additional tests are marked with up-arrows at the end of the row; which indicate that additional results are available in the Results Reports section of the website. Results Tables were prepared using Excel, but the shading system is based on the ideas in Dean McGee's Y-DNA Comparison Utility, which is available for free use at his web site. For more information about Results Tables, use the About Results Tables link in the Results Directory. Group Relationship Diagrams outline the paternal lineages of project participants, based on their conventional genealogic research. Detailed information on participant lineages is available on Lineage Charts elsewhere in the results pages. Links to chapters in Fife's book that discuss branches which appear in the diagrams are included when these are known. For more information about Group Relationship Diagrams, use the About Relationship Diagrams link in the Results Directory. Most project participants have provided a lineage including their known direct-line Ewing ancestors and their wives and children, with dates and places of birth, marriage and death. 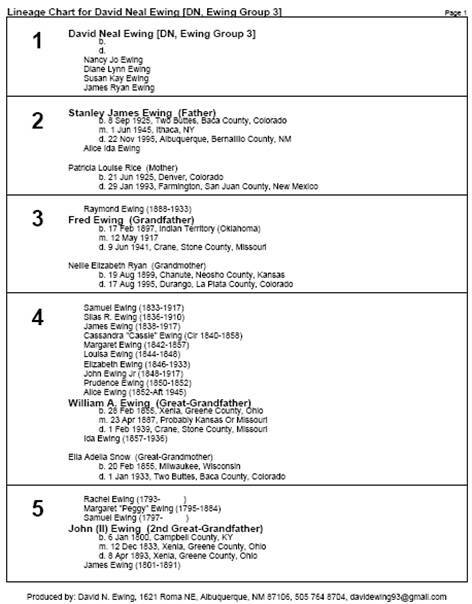 Many people find the way siblings are displayed to be confusing—please read about this in the About link under the Lineage Charts menu. We have not scrutinized or independently verified the evidence for these lineages. Some participants provided incomplete information, and we may have made some mistakes in transcribing them. For more information about Lineage Charts use the About Lineage Charts link in the Results Directory. Resources are of many different kinds. Some, like the Y-DNA Articles and a growing number of short articles explaining specific concepts, are on the Y-DNA web site and can be read or printed as PDF files just like the other Results Pages. 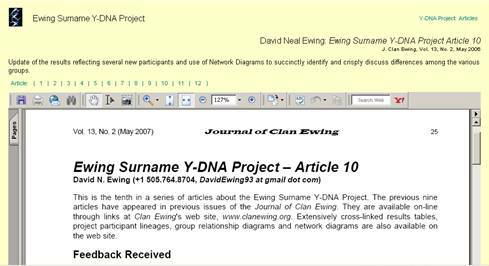 Others, like Margaret Ewing Fife’s book, are on the main Clan Ewing web site, but they look and work in very much the same way as the Y-DNA Project Results Pages. Other Resources consist of links to websites and articles elsewhere on the web. Some links will take you to Utilities that are available to help in the analysis of DNA results and in searching for genetic relatives who are not Ewing project participants. For more information about Resources use the links on the Resources section of the Results Directory. Most of the Results Pages have a set of menus down the left-hand side of the page: Network Diagrams, Results Tables, Relationship Diagrams, Lineages, Resources, etc. As you roll over each menu, a submenu of self-explanatory links appears, which will take you to other pages. For example, when you roll over the Results Tables menu, links to each of the Group Results Tables will appear. By default, the links under different menus open in different windows. So for example if you are looking at the Group 1 Results Table and you click on the link to one of the Group 1 Relationship Diagrams, it will open in a new window and you can look at the Results Table and the Relationship Diagram side by side. On the other hand, if you are looking at a Results Table and you click on the link to another Results Table, it will open in the window you had been looking at. Of course, you can toggle back and forth between the Results Tables you have opened by using the back and forward buttons of your browser. It is possible to get enough windows open at once on your desktop to confuse yourself. For example, if you have a Relationship Diagram open somewhere at the bottom of the stack on your desktop while you are looking at a Network Diagram and you click on a link to another Relationship Diagram, it will open in the buried window where you had the other Relationship Diagram open and you might think nothing has happened. Experience indicates that the best way to really study this stuff is to print the diagrams and tables that you are working on. Of course, you may very well lose a printed page by allowing it to shuffle to the bottom of the stack on your desk, too, but at least you are not dealing with apparently unresponsive links. 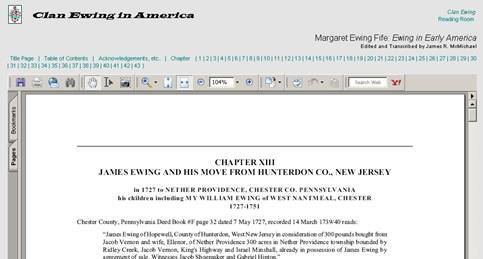 To down load any PDF, first find a link to it, then right-click on his line, then select the Save Target As option, and finally, when prompted, specify a name for the downloaded copy and a location for it to be filed away. Note that the only links in the downloaded copy that will work are those that start with http, https or www. If you are a DNA researcher and would prefer to have the Ewing haplotype information in an Excel file, click on the Raw Data for Researchers link in the Results Directory. The best way to print material from the web site is to use the PDF versions of the pages. Most pages have a link to the PDF version of the page at the top of the white window. You can print the PDF version from the web site, even if you do not have a PDF reader installed on your computer, by clicking on the printer icon in the gray bar at the top of the PDF frame (second icon from left, below the tan shaded area where the Results Pages links are located). You can also save the PDF on your computer by clicking on the icon to the left of the printer icon, but to read it or print it later, you will need a PDF reader, which is available as a free download. Please note that in a downloaded PDF version, only the links starting with http, https or www are active.